Bucks Survivor: Season Three ~ The Bucky Channel - The World of Sports from Wisconsin's Perspective. It's season three of Bucks Survivor, and it's officially the latest we've ever started this contest. That's because unexpectedly to all of us, at least at the beginning of the season, the Bucks not only made the playoffs but put up a pretty good fight. Unfortunately, the did lose to the Hawks in game seven, but I feel a lot better about the future of the Bucks than I did at any time in the last five seasons. That being said, with the Bucks season ending, the Bucks Survivor season has officially begun. Andrew Bogut has won the contest the last two seasons, but I'm very interested to see who is going to come out on top this season. On paper this is a two horse race between Jennings and Bogut, but on paper the Bucks were supposed to take last in the Eastern Conference this season. That's why they play the games. 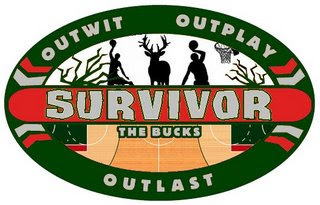 The goal of this contest, of course, is to find out which player the Bucks can absolutely not live without, and also to blatantly rip off Survivor as much as possible. Once again we'll break the squad into two teams, and they will battle each other in contests as the season progress. One team will consist of the veterans (Jerry Stackhouse, Kurt Thomas, Michael Redd, Primoz Brezec, John Salmons, Dan Gadzuric, Luke Ridnour) while the other team will be the young Bucks (Brandon Jennings, Charlie Bell, Andrew Bogut, Luc Richard Mbah a Moute, Carlos Delfino, Royal Ivey, Ersan Ilyasova, Darnell Jackson). The teams were formed not by age, but their longevity in the NBA. The teams are uneven, but I didn't have the heart to pre-cut Darnell Jackson, who was on the roster at the end of the season. Call it the Salim Stoudamire rule. This Week: You may think that our Bucks Player of the Game awards mean nothing, but they actually couldn't be more important as it serves as the barometer for how we measure the first week. We'll total up the number of POTG's both the Veterans and the Young Bucks have earned, and then average them out. Results: The Young Bucks have Bogut (23), Jennings (20), Ilyasova (6), Delfino (5), Mbah a Moute (2), Ivey (0), and Jackson (0). That's a total of 56 for a solid average of seven. POTG's per player. The Veterans have Salmons (10), Ridnour (7), Stackhouse (2), Thomas (2), Gadzuric (0), Brezec (0), and Redd (0). That's right folks, no player of the game awards for douche Redd this season. The Veterans have a total of 21, which is an average of three per guy. Voting: The Veterans are on the chopping block, but John Salmons earns immunity as he was the leader with ten. If Michael Redd isn't the first person voted out of this contest, then I'm not even sure why I'm doing this. You can vote for the player you'd like to eliminate in the poll found at the top right corner of this blog. Also, check out the history of this whole thing here. Voting will end on Fridays and Tuesdays at 6:00pm. And please help spread the word about this, it looks really sad when only nine people vote in this thing. I'm sick of Redd as much as the next Bucks fan, but dang it if Dan Gadzuric isn't the most useless player we've ever had. I have to vote him out first.